The Yokogawa Electric Corporation devised a unique Nipkow disk system with another coaxial spinning disk containing an array of microlenses, which efficiently guides the laser beams into pinholes. Akihiko Nakano; Spinning-disk Confocal Microscopy: A Cutting Edge Tool for Imaging of Membrane Traffic. Cell Struct. Funct., Vol. 27, 349-355 (2002) . 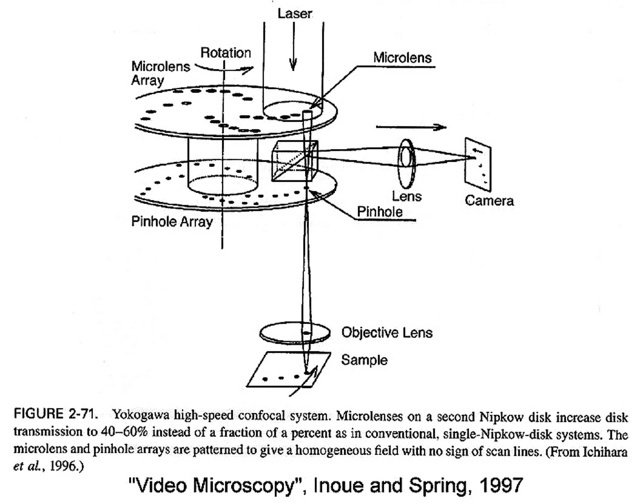 This page explains the principles of the microlens-enhanced Nipkow disk scanning technology. A typical disk has a physical pinhole spacing of about 253 microns and pinhole radius of 25 microns (50 µm in diameter). While Yokogawa has different CSU heads on the market (CSU-10, CSU-22, CSU-X1, CSU-W1) the pinhole size and the design are basically the same. 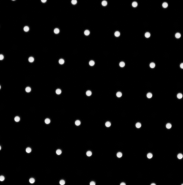 With any spinning disk, the values can be confirmed for any magnification by simply stopping the disk and imaging the illumination pattern without any sample, as in the following image. This can be easily done by opening the image of the disk in the Twin Slicer and using the mouse cursor to measure the pinhole distance and sizes. Note that for the microscopy parameters, we use radius and not the diameter. Image of a stopped CSU 22 confocal spinning disk recorded with a 60× - 1.42 NA objective, acquired by Dr. Paula Sampaio, Advanced Light Microscopy Facility, University of Porto. Pixel size 138.5 nm. See Pinhole Distance and Difficulties Calculating The Pinhole for more details.